On June 10 at 16:00 in Lake Long park (crossing of Olkhovaya St. and so forth. The Queen) will take place a ceremonial opening of the International festival of Slavic cultures "A Slavic fair". The top officials of the Government of St. Petersburg, the head of administration of Primorsky district Nikolay Tsed and guests of honour from the countries of the participants of a festival will take part in the action. After official part the gala concert will continue. This evening musical collectives "Russian North" will step on the stage; folk project from Belarus "Yagorava of a gar" (at 16:15); Reelroad folk group (at 17:00); Ivan Kupala group (at 18:00); Buranovsky Grandmothers group (at 19:00). "Slavic fair" – a festival at which various manifestations of Slavic culture are presented. Guests of a holiday are waited by numerous master classes in national crafts, the kitchens of the different people, the colourful concert program with the colour of the different people and nationalities, competitions and quizzes. 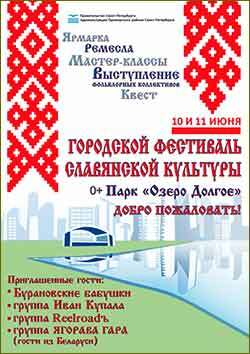 This year "The Slavic fair" is devoted to the 80 anniversary of Primorsky district. Along all platforms of a festival the panoramic photo exhibition showing the history of the territory of The Primorsky district since the most ancient times up to now is equipped. The Slavic Fair festival took place already for the 12th time and will traditionally collect professional and amateur folklore and onstage performance groups, masters of national crafts, various representatives of Slavic culture from all Russia and neighbouring countries. In three days of festival tens of thousands of the viewers will be involved in the bright world of folklore. Masters will present rare species of national crafts; will hold master classes in arts and crafts creativity. Fascinating interactive will help to plunge into the atmosphere of Slavic culture. Within the concert program of a festival the known folklore collectives from all Russia will act. The exhibition, part will become decoration of a holiday. Guests of the Slavic Fair festival will visit the farmsteads and malls decorated in the style of the different countries and areas. In farmsteads, on the trays and counter brisk trade in unique goods, souvenirs and entertainments will be developed. The organizer of a festival, administration of Primorsky district of St. Petersburg, sets the task not just to create the large-scale memorable holiday for Petersburgers and city visitors, but also to increase the general cultural level of inhabitants, to acquaint people with original national traditions, to awaken and strengthen interest in national art culture. Important problems of a festival are both preservation of Slavic national traditions, and an inkulturation of carriers of different nationalities by representation at the worthiness level of the different people and cultures living in the Russian Federation and the neighbouring countries. In 2015 the Slavic Fair was attended by more than 20 thousand guests; more than 45 folklore collectives of the city and area, over 30 onstage performance groups (choreographic, vocal, theatrical, brass bands, orchestras and ensembles of national tools, amateur performers) have taken part in the cultural program. The Slavic culture has been also presented by master classes from 52 leading masters representing traditional national crafts: birch bark processing, weaving from a rod, a fulling from wool, forge and a pottery, an embroidery, a kruzhevopleteniye, a list on a tree, amber processing. Entrance on action free! There are no age limits! Culture news archive for 09 June' 2016. Culture news archive for June' 2016. Culture news archive for 2016 year.